On a day in which the Florida women’s basketball team honored its alumni – the players, coaches and support staff members – who each have played important roles in the storied 35-year history of the program, the No. 19 Gators notched another impressive accomplishment as part of what is becoming a memorable season of firsts. Senior forward Marshae Dotson scored a game-high 20 points and Florida recorded its first win against Georgia since Feb. 26, 2004 with a 61-45 victory on Sunday in front of 2,413 fans in the Stephen C. O’Connell Center. The Gators (17-2, 3-1 Southeastern Conference), who snapped a nine-game losing streak to the Bulldogs in the all-time series, forced Georgia into 23 turnovers in the game, resulting in 30 Florida points off of those miscues. 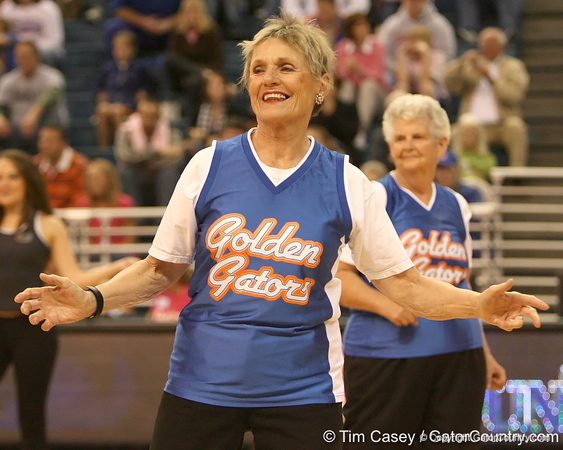 The Golden Gators perform during halftime of the Gators' 61-45 win against the Georgia Bulldogs on Sunday, January 18, 2009 at the Stephen C. O'Connell Center in Gainesville, Fla.